On the snapshot bellow the data in RadGridView is sorted ascending by the Est. 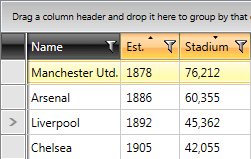 column and then sorted again by the Stadium column, without removing the previous sorting. This feature is called multi column sorting. To learn how to implement progtammatic sorting in your RadGridView read on this topic. Run-time you can sort by multiple columns by just holding the Shift key pressed and click all column headers you wish to sort your data by. For more key combinations read the Keyboard Support topic. 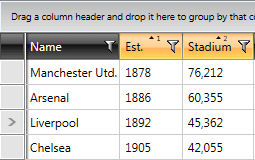 You can check how the column headers will look like after the user has sorted on multiple columns.